I make at least one frittata every week. Eggs are literally the best source of protein which is a great way to start you day. I’m not a pastry eater in the morning, and I’ve always found it strange to have dessert for breakfast. Our standard American breakfast sets you up for sugar imbalances leading to food cravings and low energy for the entire day. Getting a generous serving of a protein rich breakfast will keep your mind and body alert and begin a day of healthful eating. My frittatas always get a generous helping of greens. I use every type including mustard greens, kale varieties, root tops and more. Another great thing about frittatas is the the ease in throwing one together. With only a few minutes of prep you can get your pan filled and set a timer while you continue your morning routine. This is also an impressive dish to share with company. Frittatas are started on the stove top and can be finished on the stove top or in the oven. If using the oven, preheat to 400 degrees. Crack the eggs into a bowl and whisk vigorously with milk. In a 10 inch skillet over medium heat, melt ghee. Add green stems, spicy peppers and a pinch of salt. Sauté for 2 minutes or until stems are tender. Add leaves and continue to sauté until leaves are wilted; about 2 more minutes. Lower heat to low and add egg mixture. Sprinkle cheese on top. Do not stir frittata. Cover and cook on low on the stove top or in the oven for 10 minutes or until the eggs have set. If you want to make a larger frittata, use a larger skillet. For frittatas larger than 6 eggs, I recommend finishing them in the oven to prevent the bottom from burning while waiting for the eggs to set. Cooking time will also need to increase. I would start with 15 minutes in the oven. 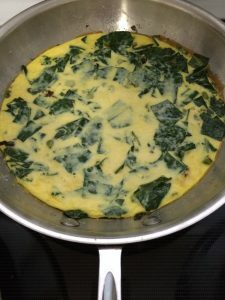 This week I used collard greens, pecorino cheese and dried chipotle peppers for my frittata and I cooked it in the oven.